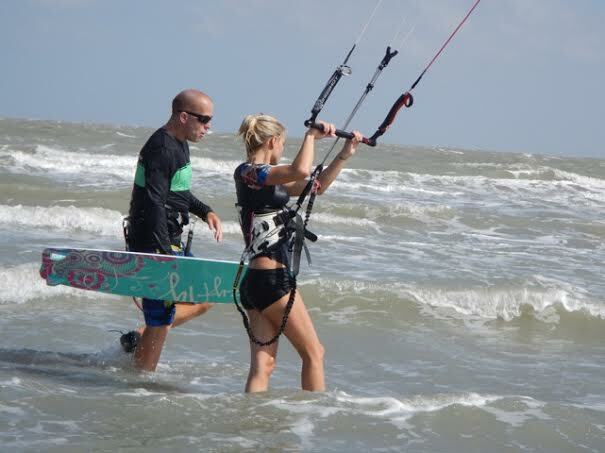 During this three hour water based lesson you will be introduced to the sport of kiteboarding through an instructor led demonstration and discussion on kiteboarding safety, wind theory and different types of equipment and set up. Then the student will get the hands on experience of actually setting up a full size SLE Kite, learning to fly and control the kite in the water, and then attempting to ride, all under the close guidance of an experienced Instructor. This Lesson is for students who would like extended instruction on the water. The 5 HR KITE LESSON is usually spread over 1-2 sessions depending on conditions and the student's schedule. This Lesson is for students who would like to progress through the skills to become an independent beginner in the shortest time possible. The 10 HR KITE LESSON is usually spread over 3 sessions depending on conditions and student schedule. Most students can realistically expect to be able to ride both ways, go upwind, transition, assist launch & land, and have a good understanding of the basic safety skills needed to enjoy kiteboarding safely. Want to bring a friend? or significant other? Bring them along to share the experience (max. of Three (3) students - ask about our semi-private and group lessons). All equipment is provided by 361KITE, students need to be dressed appropriately for water activities and bring sunscreen and/or hats/sunglasses as well as any water/liquids. Water shoes or reef booties are highly recommended to protect your feet during the lessons - these can be found at local sports supply or retail stores (Academy, Walmart) or water sports/boardsports specific shops locally (Dockside, Wind & Wave). Any KITE LESSON is a great class to give as a gift to the aspiring kiteboarder, ask us about Gift Certificates. Call/text now at ﻿(361) 742 - 7966﻿ or email info@361KITE.com to reserve your lesson today.